Top quality litho-printed NCR Pads for clean copies without the need for carbon paper and in handy pad form. NCR (No carbon required) pads from Flexpress are identical in function to our NCR sets but come glue-padded into handy pads of 50 sets per pad. Whether or not you request a proof, all supplied artwork files undertake our rigorous 10 point file check to ensure your printed job turns out exactly as you intend. Files are automatically imposed ready for printing in the most effective way to minimise waste. 4 part (NCR) pads are available as a white top sheet followed by yellow, pink and green sheets or blue yellow and pink sheets. Our NCR pads are all printed lithographically which guarantees accurate registration between sheets and reproduction of fine lines and detail. Please note: all parts are printed identically i.e using the same image to the front. 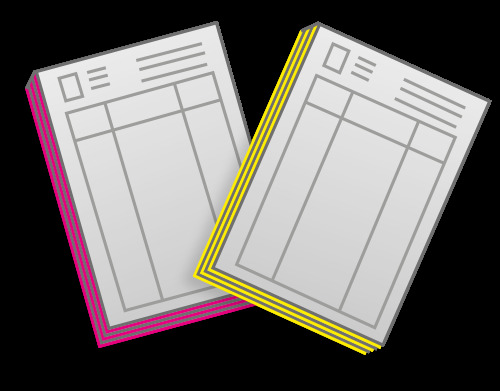 If two-sided print is requested a second image (such as terms and conditions) can be printed onto the reverse side of each sheet. NCR sets use pre-collated materials for speed and efficiency. These are then glued into pads of 50 sets. If sequential numbering is required please don't forget to state your starting number when placing your order. Optional standard 2 hole, or 4 hole drilling is also available. All products are packed in strong double-wall corrugated packaging to minimise damage in transit.